Sunday Photo; Maitreya Hall – Wake Up and Laugh! 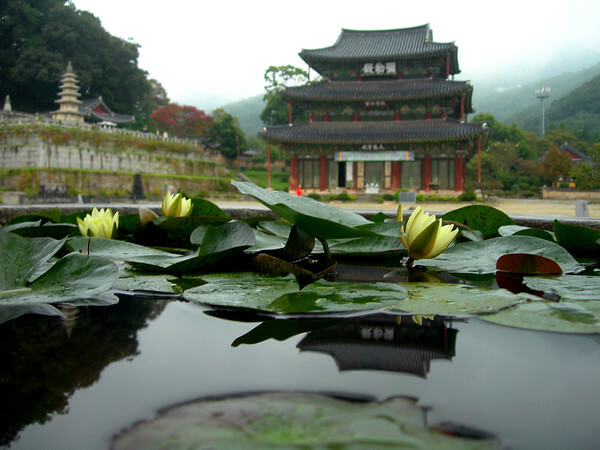 Though the grounds of the Gold Mountain Temple are scattered with National Treasures, the most striking of them all is the three storied Maitreya Hall, the only one of its kind remaining in Korea. Originally built in 599, the current buildings have been standing since 1635, after the entire complex was burned to the ground due to the discovery of a small army of monks who had gathered to train here in hopes to fight off the Japanese invaders. There must have been intense debates among the temples at the time about whether or not to fight the Japanese. In the end the reasoning was that, ultimately, to fight them off would be less harmful. I believe the analogy was, if you see a rabid dog charging a group of children, it’s better the kill the dog than to allow it to attack the children. To borrow the conclusion of another anecdote, perhaps they struck down their opponents with all the compassion they could muster. Interesting story. just yesterday night my son and i had a lively discussion about wether a culture should/could be saved by force or not. I have to wait until Sunday evening to post because of the time difference in Korea. Even then, it’s still Saturday night on the west coast in North America! As always, a beautiful Sunday photo. Love the perspective of looking across the lotus. haha, it would have been fun to climb in! It was actually a stone pool they were growing in, the perspective makes it look a bit bigger that it was. Where is this temple located, Joseph? It’s a beautiful building! I love having Sunday on Tuesday! Beautiful pictures. I shall have to come to Korea and get some photography lessons!! !